YARMOUTH — The Town Council on Thursday unanimously voted to grant conservation easements to the Royal River Conservation Trust – a welcome birthday gift to the organization, which is celebrating 30 years this week. RRCT Executive Director Alan Stearns said granting the easements was the final agreement to be met with the town in the two entities’ partnership to purchase about 24 acres of land along the Royal River that is owned by Steve and Greg Dugas. The trust will celebrate this and 30 years of conservation with a celebration from 6-10 p.m. Thursday, Aug. 23 at Skyline Farm in North Yarmouth. Those interested in attending should RSVP at rrct.org. The Dugases agreed to sell the riverfront property for $250,000, or $135,000 less than its appraised value. The parcel is east of the Royal River, bound by the 22-acre Hilda Barker Preserve and the 35-acre Sligo Road Reserve – both owned by the town. By purchasing the land and connecting the two town-owned properties, the trust hopes to create a corridor for trails and protect a half mile of Royal River shoreline. Together, the Dugas’ land and the town-owned land would be called the Riverfront Woods Preserve. In May, the Town Council unanimously voted to sign an option to acquire the land and indicated a willingness to pay up to $110,000 for the purchase from the town’s land acquisition reserve accounts. The conservation easements will assure the land will not be developed in the future. The trust has raised $50,000 and, with the town, applied for and received a $110,000 grant from the Land for Maine’s Future program. However, Stearns said he doesn’t anticipate the sale closing until the end of the year, as the LFMF funding is still pending final approval from their board. RRCT is a regional land trust serving all of the towns that form the Royal River watershed – a different model than many town-by-town land trusts in Maine. It grew out of the Friends of the Royal River and four local land trusts in Yarmouth, Pownal, North Yarmouth and New Gloucester. Since 1988, RRCT has conserved more than 4,000 acres of land in nine communities and has deeds in eight towns: Yarmouth, North Yarmouth, Pownal, Gray, New Gloucester, Cumberland and Poland. RRCT-owned preserves include Littlejohn Island Preserve, New Gloucester Intervale Preserve, Chesley Meadows Preserve at Runaround Pond and more. The trust has also assisted in multiple partnerships like the one it has with Yarmouth to create the Fels-Groves Farm Preserve and Spear Farm Estuary Preserve, both in Yarmouth, Knight’s Pond Preserve in North Yarmouth and Cumberland, and the expansion of Bradbury Mountain State Park in Pownal. While completing the most recent transaction is only one step in making the parcel accessible and enjoyable for the public, Stearns said the trust envisions about a half-mile loop through the property between wetlands and along the Royal River, to be known as the Carriage Trail. The town’s Parks & Lands Committee will be responsible for maintaining the trails. According to Stearns, the committee wrote into the conservation easement that the core purpose of the preserve is a be a “quiet” and “contemplative” habitat. 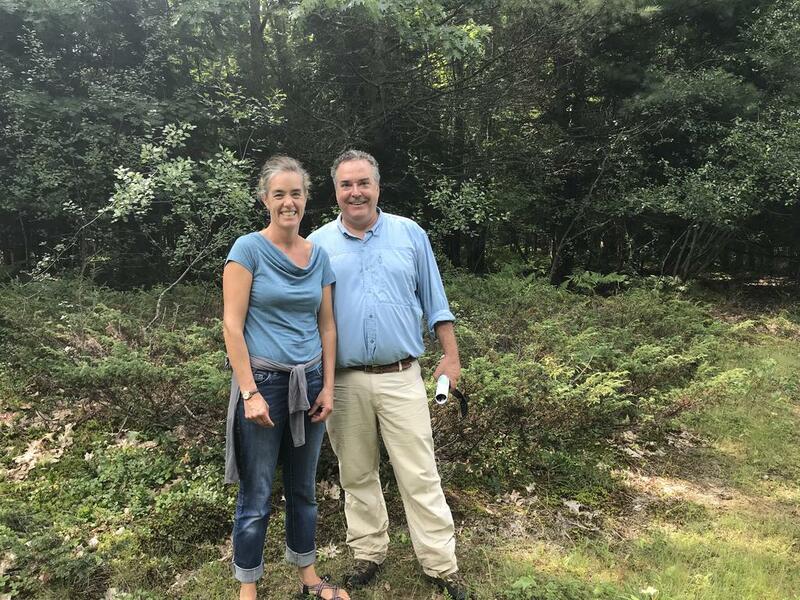 Carrie Ridgway, development director and office manager of the Royal River Conservation Trust, and Executive Director Alan Stearn take a stroll Monday morning through what will be the Riverfront Woods Preserve.